“Pate brisee,” I thought, my heart dropping to my shoes, “uses olive oil.” I use it all the time and have always called it shortcrust pastry. 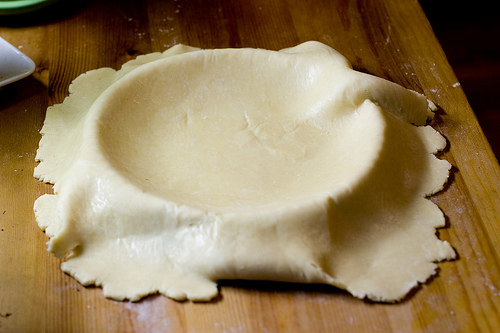 But of course, it isn’t really shortcrust pastry at all! All those recipes are wrong! Well, as it turned out, the goat’s cheese pie pastry isn’t even pate brisee; it is made entirely with olive oil and I don’t care for it much at all. But I was left with the fact that pate brisee is not shortcrust pastry. Way back when you were all in kindergarten or pre-school, Simone Beck came to Brisbane for a series of cooking demonstrations and to promote her book ‘Simca’s Cuisine’. Simone Beck is best known, not for ‘Simca’s Cuisine’, but for co-authoring that two volume bible ‘Mastering the Art of French Cooking’. We were all very aware of her legendary importance in the world of haute cuisine and were suitably riveted. She made mushroom tartlets (Quichettes aux champignons). They were delicious and became my stand-by recipe for many years, as you can see if you look at the state of p232 of ‘Simca’s Cuisine’. Pate brisee “A”, she grandly informed us, and Pate brisee “B”, are to be used for ALL savoury dishes. Obediently, I complied. Pate brisee “A” was fine by me; I have never tried “B”, which substitutes white wine for the water and a whole egg for the egg yolk. Perhaps I should. She says the wine creates an interesting saveur. Naturally, I then abandoned Nanya’s sweet shortcrust pastry for Simone Beck’s Pate sucree. The funny thing about that day is that I swear Elly was with me. Obviously I was more impressed than she was! Well, I have altered all those recipes, or I think I have. Fortunately dessert tarts weren’t affected. Where, in savoury tarts, pies or quiches it once said ‘Shortcrust pastry’, it now should read ‘Pate brisee, shortcrust pastry or sour cream pastry’. I apologise. Elly still doesn’t know that she ruined my day.